I’m going to use my latest book, Mr. Wuffles! 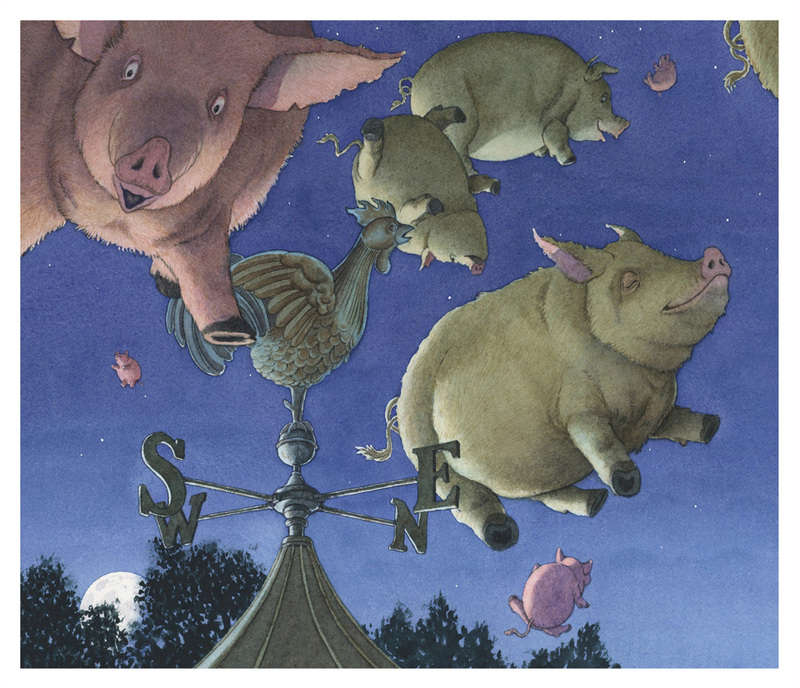 to go through the process of creating a single page of a picture book – concept to finished art. The page I chose is page thirty-two. That is the final page of a standard picture book (It would be page forty or forty-eight in a longer book). 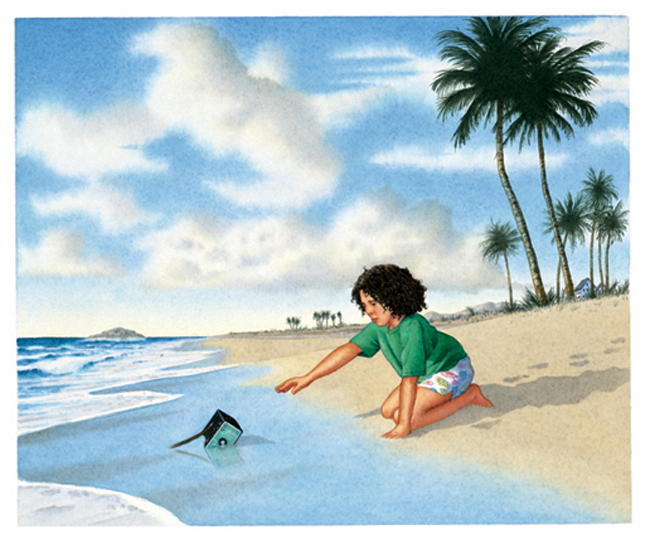 From a story standpoint, the last page in a picture book brings with it a lot of baggage. It can be the end of the story or it can be an extra surprise – one last “kicker” of an image to close the book. 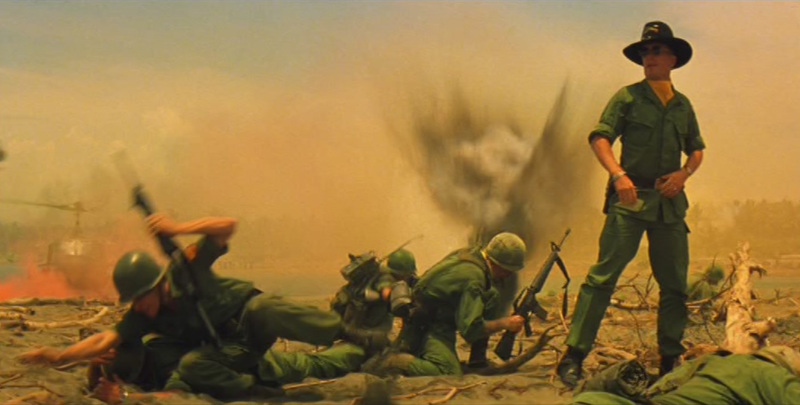 It can be a visual summation of the emotional essence of the story. That last turn of the page is critical to bringing the book to a satisfying conclusion – it shouldn’t just peter out. 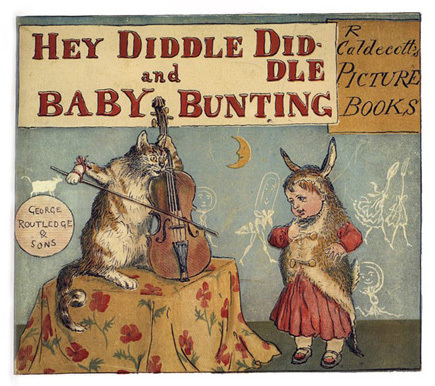 It is in his books that the modern picture book is born. He took short texts and spread the pictures across all the pages, opening up books visually in a way that hadn’t been done before. 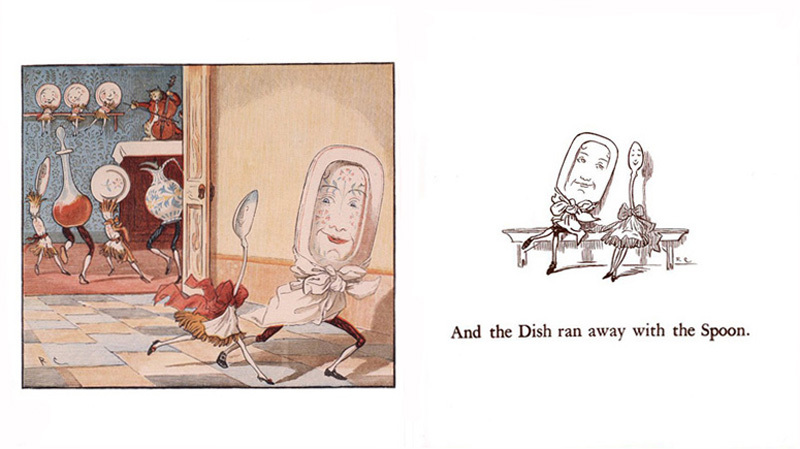 On the left page is a full color, full-page image of the dish and spoon running away. 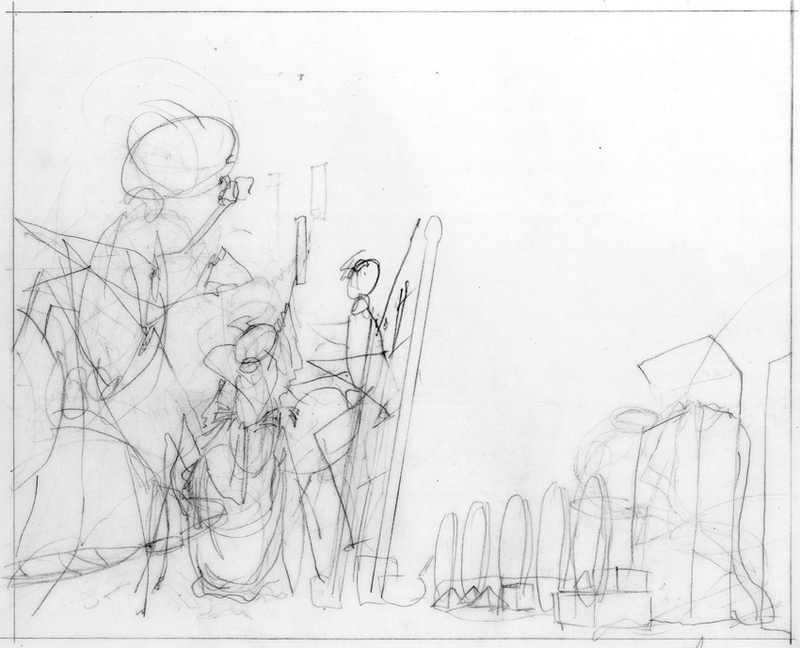 On the right page is the line of text and a drawing showing the dish and spoon sitting happily together – a continuation of the story through pictures. 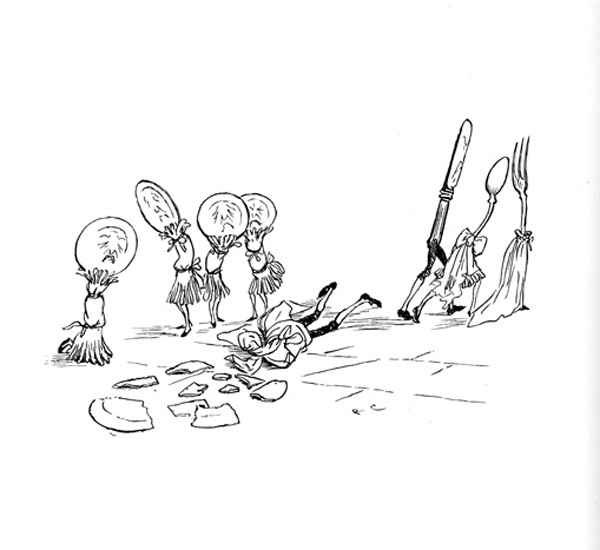 The knife and fork – apparently the spoon’s parents – have come to take her away, leaving the dish broken on the floor. So much- rather sad – story contained in this image. It leaves the reader a little shocked. Again, none of that is in the text. This is a radically new kind of storytelling. It was a visually captivating way to show the friendship that had been formed between the two characters. The story ends on the previous page and this last page (Page forty-eight, actually) adds an emotional conclusion. And now to Mr. Wuffles! The book is about a cat who discovers that tiny aliens have landed in his house. The tormented aliens find allies in the bugs that live behind the wall of the house. With the help of the bugs the aliens finally escape the cat and return to space. I knew I wanted page thirty-two to be a look at the lasting effect that the alien visit has had on all concerned. From a story point of view there seemed to be two options: a scene behind the wall and a scene on the alien’s home planet. I liked the idea of seeing the aliens at home with some representation of their visit – their own mural, perhaps. I also envisioned one of the bugs traveling with them. 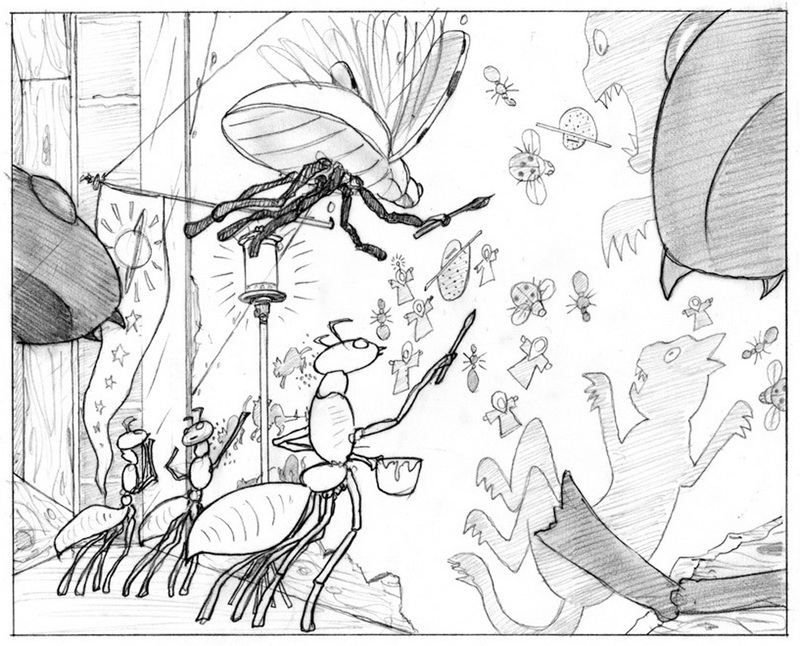 One solution for the new version was to have two panels on the last page – one showing the alien world and one showing the bugs behind the wall. But, I like having a full-page picture for that last image. 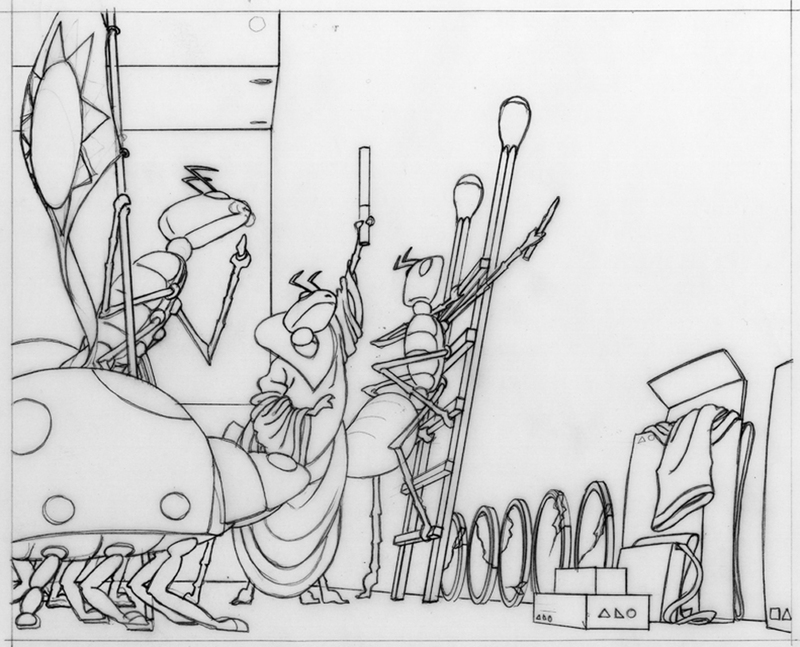 Also, two smaller panels wouldn’t allow enough room for all the detail that would bring those scenes to life. 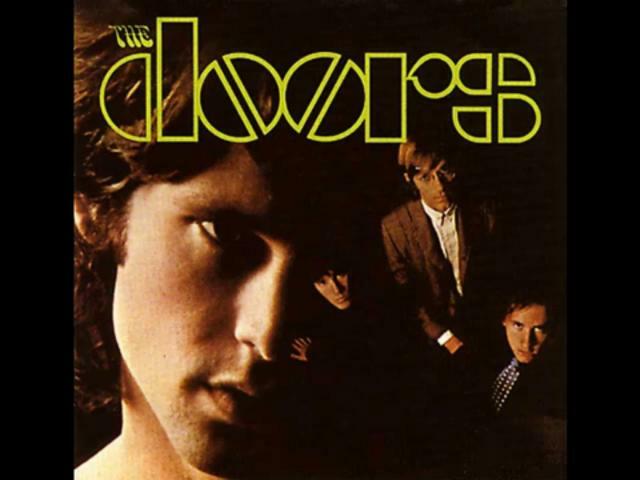 Ultimately, it felt right that the scene should stay in the house where all the action has taken place. It made more visual sense as well. 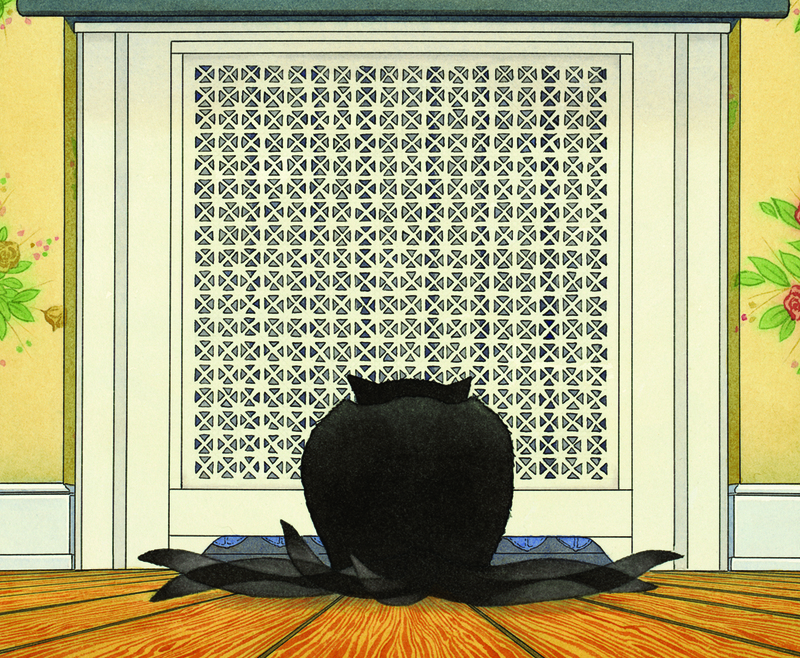 The cat sits in front of the radiator on page thirty-one and the turn of the page shows the reader what is on the other side of the wall. 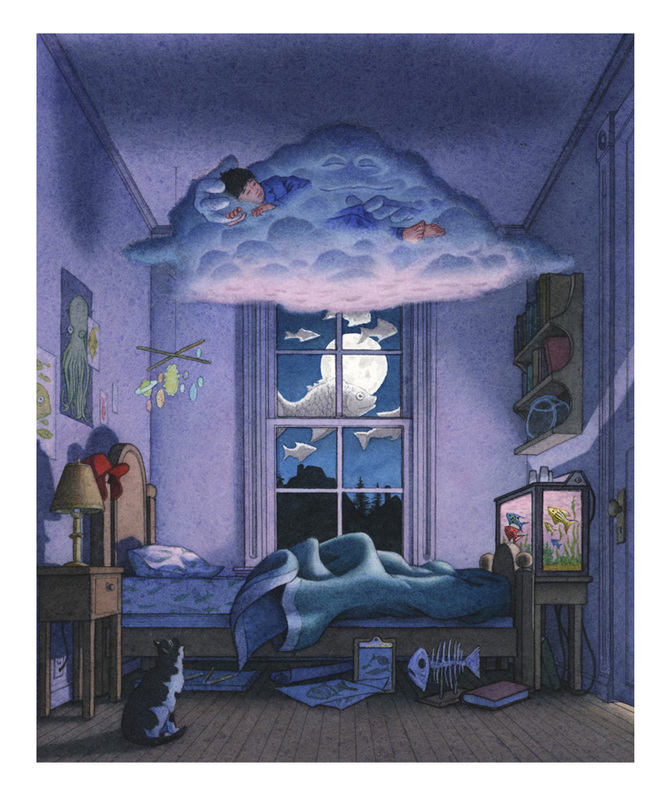 I liked this from a story perspective as well as compositionally. But, I really felt that the scene should stay with just the bugs who have actually been a part of the experience. It’s their story. 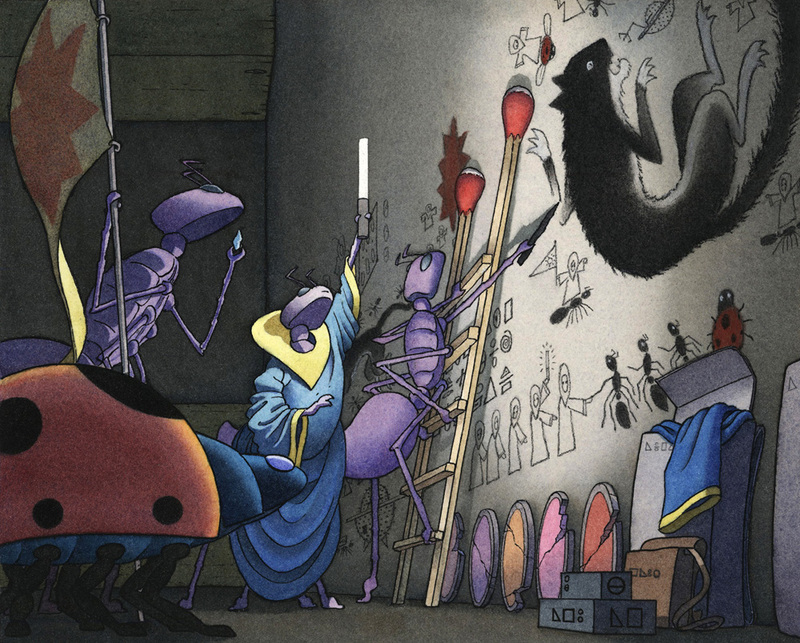 I liked the ant on the matchstick ladder and the ant in the alien robe holding the light. The alien backpacks were good. The discs against the wall are the broken parts from the spaceship. The problem with these is one of scale. First, the scale of the space is wrong. Those bugs are tiny – we simply wouldn’t see that much of the wall to the left and the back wall would be very far away. The way I’ve drawn it, that space would be unbelievably narrow. Second, the ant and the ladybug on the left are too small compared to the other two ants. As they are in the foreground, they need to be larger. 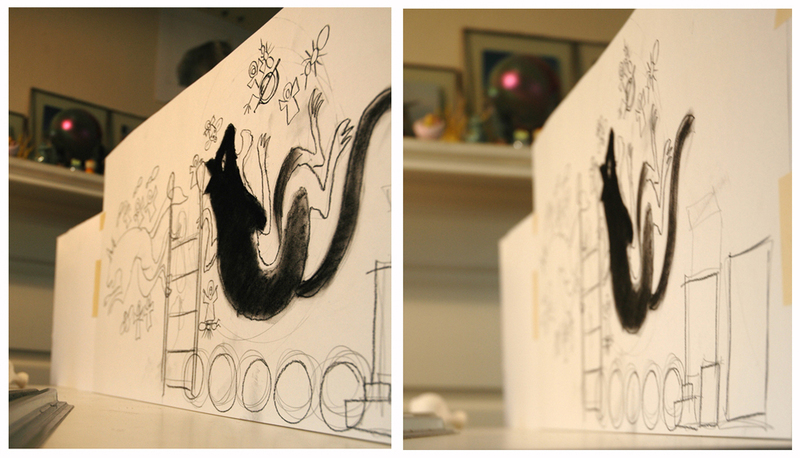 The drawing on the right, above, gets the foreground ant at a better scale, but the ladybug is still too small. And the space is still not right. And the flag can’t be hanging – it makes the composition too busy. Here the scale of the ladybug is good. I’ve given the flag to the ant to hold. I’ve simplified the space – just two-by-fours in the distance. No wall on the left anymore. I’m happy with this. Now I need to add the mural to the wall. 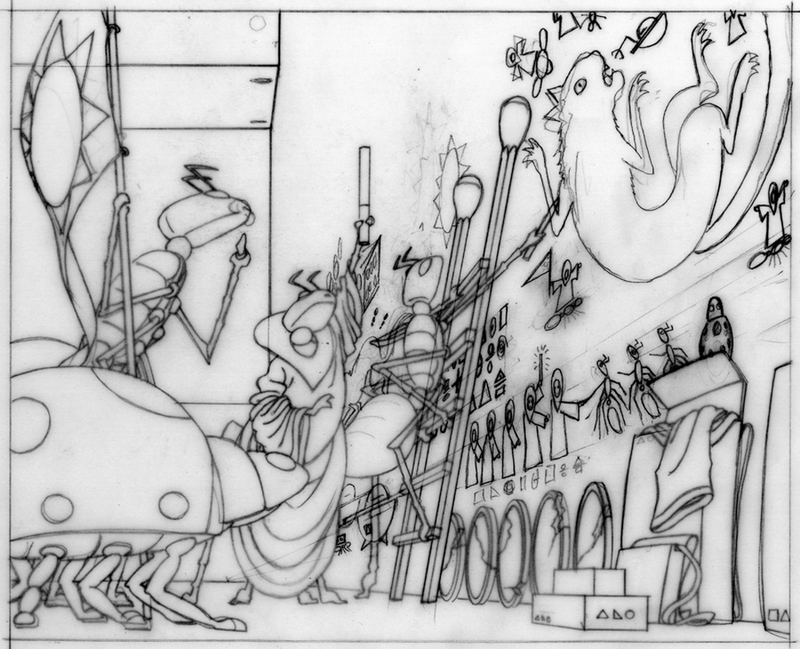 The mural in the double page spread earlier in the post was shown flat – not in perspective. This wall is in perspective, so the mural will be, too. Next is to determine the light. Light is everything. Everything up to this point is factoring narrative into it – how does what I’m putting into the picture impact the story? Now it’s time to paint. 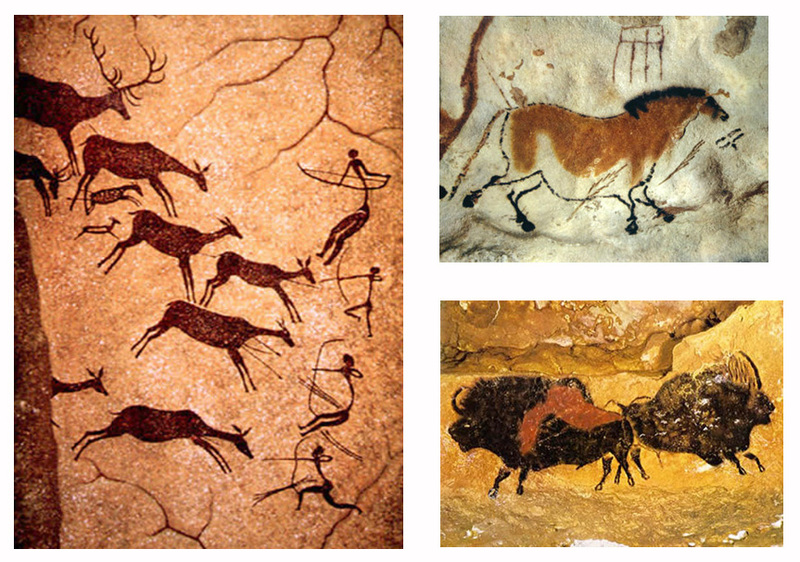 Painting is about painting – how well I can realize the image. 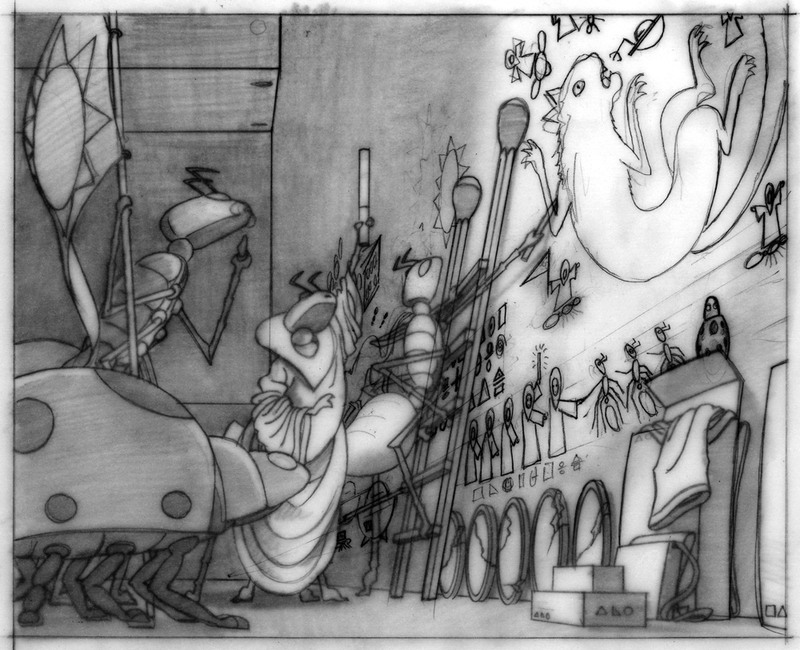 After the grand adventure of the story, this page shows the bugs creating a new mural – one that depicts the meeting of their new friends, some of the alien language, and the defeat of Mr. Wuffles. This tale will become an enduring legend among the inhabitants behind the wall. So, there you have one page from a book. Only thirty-one more to go.